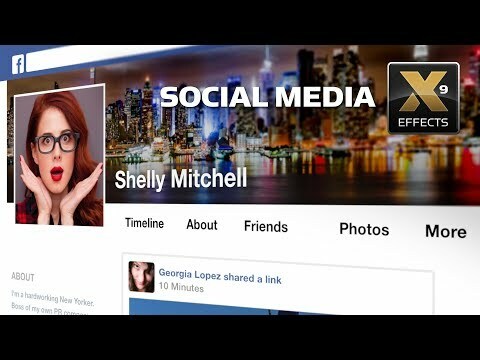 XEffects Social Media is a set of over thirty professionally designed templates for Final Cut Pro X that emulate popular social media posts and webpages. Templates include all the elements for single posts or webpage construction of Facebook, Twitter, YouTube, Instagram and Vine accounts. All the information, avatars, text and of course images or video for the drop zones are all customisable. All elements are built with vectors - zoom into the GUI as close as you like. Emulate Facebook, Twitter, Instagram, Vine and YouTube single posts and webpages in FCPX. Use images or videos in posts. Customise avatars and all text onscreen. Built-in counters automatically increment likes, follows & loops. Choose animation method for single posts. See how to build each type of social media post - Download a demo project! We have built the sample posts so you can see how to build your own. The timeline is 4K, but everything will scale if you work in 1080. Pull them apart, explore the options in each plugin or maybe use the project as a start for your own social media posts. Learn how to use Social Media to emulate popular social media posts and web pages.